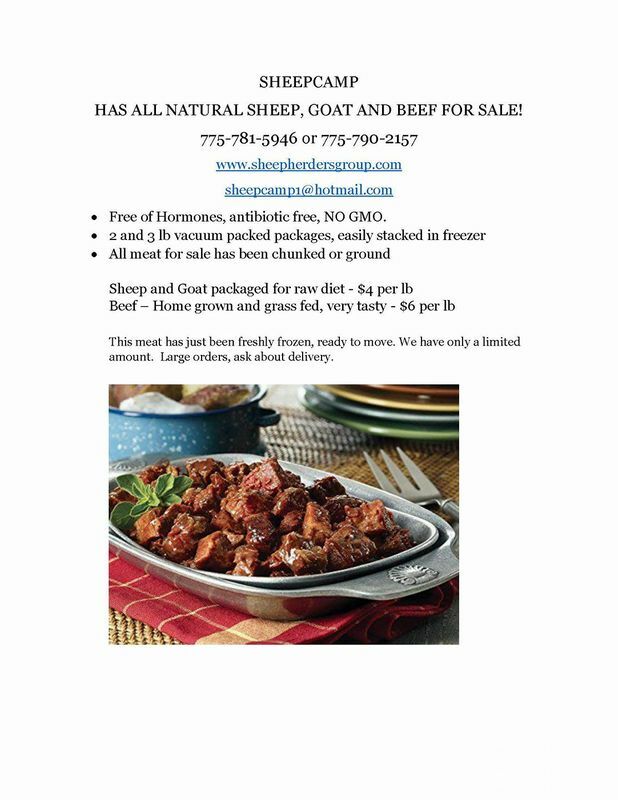 Sheepcamp has all Natural sheep, goat and beef for sale! Sheepcamp has a limited supply of all natural sheep, goat and beef for sale. Contact us for more information. Monday and Tuesday April 18th and 19th! We are offering 2 options! Option #2: (if available) 1/2 hour private lesson $65.00 Time includes assessment, verbal discussion & stock work with dog. Have you Herd??? Tests are open to any & all breeds and all ages!!! Saturday, Feb.13, 2016 ~~ 9:00a.m.-3:00p.m. Saturday, Feb.20, 2016 ~~ 9:00a.m.-3:00p.m. 100% of proceeds support our Herding Events!! Take I580 / 395 South to Carson City where I580 ends. Exit and turn right onto Fairview Drive / 395 /50. Turn left onto S. Carson St. (395 / 50) and continue south on 395 to Minden/Gardnerville. Turn right onto Hwy 756 (stoplight at Sharkey’s Casino). Turn left onto Dresslerville Rd. at the 4-way stop. Go .6 mile to 1350 Dresslerville Rd. and turn left into lane; follow signs to parking area on the left.